Now that weather is nice and warm outside, spending a day at the beach might be nice. If you live close to one and are out there on a regular basis, you might want to check out this bag to take with you. 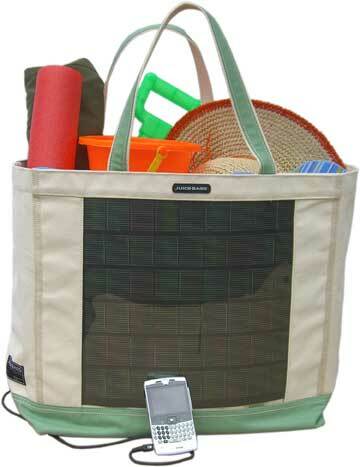 It’ll hold all of your necessary beach essentials, all the while giving your technology a little boost. After all, spending all that time at the beach might drain your battery and give you little opportunity to charge your phone or iPod again. You might as well invest in a way to charge your gadgets while you’re on the go. This would be especially great if you enjoy laying out in the sun and playing your iPod while you’re out. Eventually, it’s going to go dead, so instead of giving up on your music, just plug it into this solar bag and you’ll be ready to go again. Of course you’ll have to wait a little while for that to happen. Specifically, you’ll have to wait about 2-4 hours of charging before it’ll be up and running again. Most gadgets will require about 2-4 hours, be it cellphones, cameras, GPS or your camcorder. You’ll have to be careful with the bag around water though, thankfully, they did make it so that the bottom is water resistant though. You can purchase the tote bag for $249.99.